Contemporary and classic. 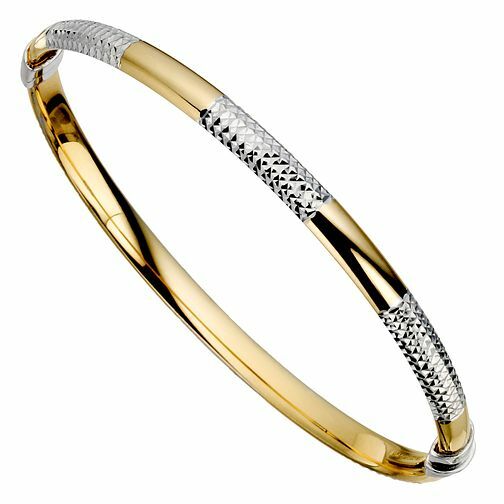 A bonded silver and 9ct yellow gold bangle. Shimmer and shine. Just the thing for a woman who knows how to make an impression. Please note the colour of the clasp may differ. Two precious metals, silver and gold are bonded together in perfect harmony to create these beautiful pieces. Together Silver & Bonded Gold Bangle is rated 5.0 out of 5 by 4. Rated 5 out of 5 by Anonymous from Expensive looking bangle. This is a lovely shiny, sparkly bangle which shows off a tan to its best at this time of year. Would suit any age group. Fairly sturdy.